The wait is nearly over. Owner Tamares Group started the renovations, opting to keep the hotel closed and do them all at once, and the results sound promising. Almost everything has been fixed up or completely redone top to bottom, and with the re-opening scheduled for September 1, the project is ahead of schedule. The Plaza was aided by some items coming at a discount from the shuttered Fountaineblau project that helped the budget for the renovation. In a time when the tourism and economy of Vegas is starting to pick back up, the Plaza is targeting the typical Vegas crowd to convince them that the Plaza has changed. It will reopen with a new casino floor, lounges, and several restaurants, including a steakhouse named for former Las Vegas Mayor Oscar Goodman. 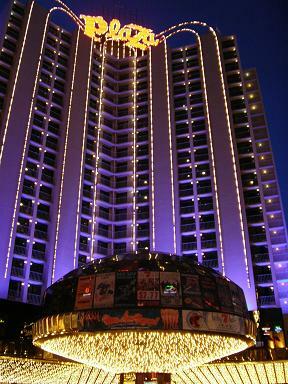 Don’t forget to check out our hotels page for all the information on every hotel in Vegas. We wish the Plaza the best of luck. This entry was posted in News and tagged Las Vegas, Las Vegas Coupons, Las Vegas food, Las Vegas Hotel Coupons, Plaza Hotel and Casino, Vegas Coupons, vegas gambling, vegas hotel, Vegas Renovations, Vegas restaurants by admin. Bookmark the permalink.